Our Lancaster, NY, orthodontist is here to remind you: no matter what type of braces you get, your oral hygiene habits will become infinitely more important during orthodontic treatment. Caring for and maintaining your braces along with your entire mouth can be the difference between having beautiful, healthy teeth after your braces come off or having de-calcification from bacterial build-up. 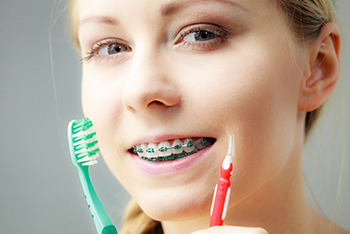 Your tooth brushing habits are important anyway, but brushing when you have braces is absolutely crucial. Our orthodontist in Lancaster, NY, wants you to remember – if you have braces that are attached to your teeth, the bacteria in your mouth have a number of new places to hide! According to our Lancaster, NY, orthodontist, the spaces between your teeth can also serve as a great hiding spot for bacteria, which can eventually turn into cavities. Though the first few times flossing with braces may be a little uncomfortable, your gums will soon get stronger. As you continue, your gums will get healthier and you won’t have to worry about anything being in between your teeth to make them decay. To get the absolute most from your oral care regimen, you should floss, brush, and rinse your mouth with mouthwash. Do You Want To Know More? Call Our Lancaster, NY, Orthodontist! This information is not meant as medical advice. It is provided solely for education. Our orthodontic office near Lancaster, NY, would be pleased to discuss your unique circumstances and needs as they relate to these topics. Feel free to give us a call at 716.633.4747 or click here to schedule a complimentary exam and consultation with our 5-star-rated More Than A Smile orthodontist.